Guernsey FC will play Leatherhead in the semi-finals of the Isthmian league South play-offs after their opponents were deducted six points. Leatherhead were penalised after a 'registration irregularity'. It comes after Guernsey drew their final home league game of the season 2-2 against Folkestone Invicta, who go up to second-place after the deduction. Dave Rihoy salvaged a point for the Green Lions with an 89th minute equaliser at Footes Lane on Friday. 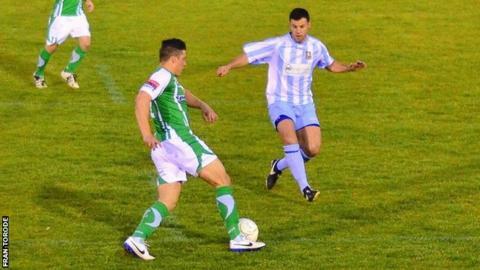 Guernsey went a goal down after three minutes, but Ross Allen equalised later in the first half. Folkestone took an 87th minute lead from a free kick, only for Rihoy to level two minutes later. It means Guernsey finish their first season in the Isthmian League Division One South in fourth place. They will travel to Leatherhead for their play-off semi final on Tuesday 29 April. The play-off final will be held on Saturday 3 May.